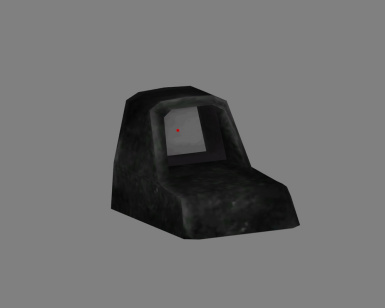 Meshes and texture for very rudimentary look-through red dot sights, made using 90% base-game assets. Since this is a modder's resource, no permission or credit is needed to use and include these files in your own mods, but if you'd like to give me a shout out, I would really appreciate it! And please send me a link to any projects that use this, so I can see all the cool stuff people are doing with it! This is a modder's resource. 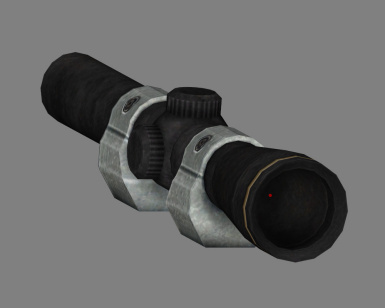 I've often found it frustrating that all the optics in the game force you to use a scope overlay, and anything that you can download online uses much nicer textures that don't blend in with the base game models at all. 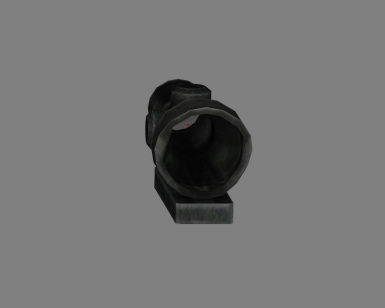 I figured there had to be a way to make a base game-style optic that could be used while in iron sights mode. I used 90% base game assets for this resource, starting with the small RMR reflex sight on top of the ACOG-style scope on the Marksman Carbine. I enlarged it and hollowed it out, but maintained the base game texture for maximum compatibility. I added the lenses from the missile launcher sighting system (with a clear texture that I made myself, the only custom content in this resource pack) and the dot is the glow sight from the 9mm Pistol, shrunk down and retextured to be red. The sight was designed so that it can be placed facing either way, forwards or backwards - whichever best suits your needs! UPDATE 2/18/2019: Pistol scope added. The only custom content that needs to be included with any mod that you use this in is a single 128x128 texture file that must be extracted to Data/Meshes/Weapons/Accessories/RMRLens.dds. The NIF itself has three separate parts, but they're all contained inside a parent node, so you can easily copy and paste it into your custom meshes.